Students in any Wright State major may benefit from a minor in geography. With new technologies and applications making the geography major a very marketable degree today, the knowledge and skills gained in the geography minor will enhance your resume and employment opportunities. Declaring and successfully completing courses for the approved minor is certified on your official transcript upon graduation. Geographers answer everyday questions, such as what is the best route around a highway detour to questions of survival. For example, How will we feed the world's growing population given changes in earth’s climate? Where are pockets of disease in the world and where have they spread? How does satellite data help us be safe? How does where people live affect their access to healthy food, adequate housing, and sufficient healthcare? View the Geography program profile for sample occupations, average salary, and employment projections. The geography minor is comprised of 18 credit hours; two required courses; Human Geography (GEO 2100) and Physical Geography (GEO 2200) and four geography electives from which you may choose. View the checksheet below to see potential electives for the geography minor. 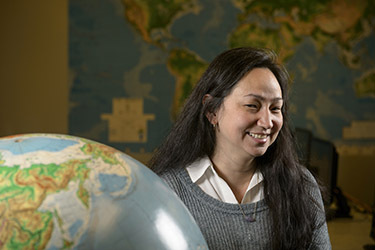 View Minor in Geography program information and degree requirements in the University Catalog.